The time has finally come. Of course, we’re talking about Ariana Grande kicking off her highly anticipated ‘Sweetener Tour’. With only two performances of the tour under her belt so far, the singer has already received extremely high praise from a plethora of media outlets including Rolling Stone, Billboard, and Buzzfeed. Rolling Stone called the 25-year-old’s fourth concert tour, “…full of emotional drama, iconic looks and undeniable hits.” The magazine goes on to credit the singer’s ability to bounce back with her first tour since the tragic Manchester bombing at her show in 2017 and recent loss of her ex-boyfriend, Mac Miller. Grande has not been shy in sharing her ongoing struggles with coping with the recent tragedies which turned her world upsidedown. In an emotional Instagram post a few weeks before kicking off the tour, she revealed, "i can't really fathom all that has happened over the past few years...i'm prolly gonna cry a lot...i'm still healing but i feel a lot lighter as of late and i think this [tour] is really going to be such a beautiful time." The media has highlighted the wildly successful star’s lengthy list of fan-favorite songs on the show’s setlist. 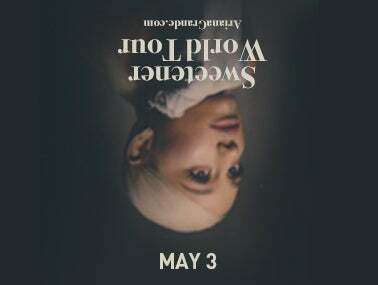 Included in the show are performances of songs such as “God is a Woman,” “7 Rings,” “Breathin,” throwbacks like “Break Your Heart Right Back,” and “Love Me Harder,” and of course the record-breaking title track of her most recent album, “Thank U, Next”. There is no telling what other kinds of surprises will be in store for us when the new queen of pop brings the show to Sacramento on May 3! Whatever she brings us, we know it will be *sweet*.